Hey, friends! 🙂 It snowed again this morning, and then Lana didn’t want me to leave her at school. It was a rough start to the day, but Lana ended up being fine, and I was able to do a try-on session at Old Navy! There are so many affordable, cozy gifts for her there right now, and I made sure to grab a few! The sweatshirt I’m wearing above is the perfect, subtle way to be festive this month! It is so cute, and you can wear it all Winter long! I’m wearing the size Small, and it’s currently on sale for under $25 when you use code “SWEET” at checkout! The whole website is 20% off when you use that code right now! 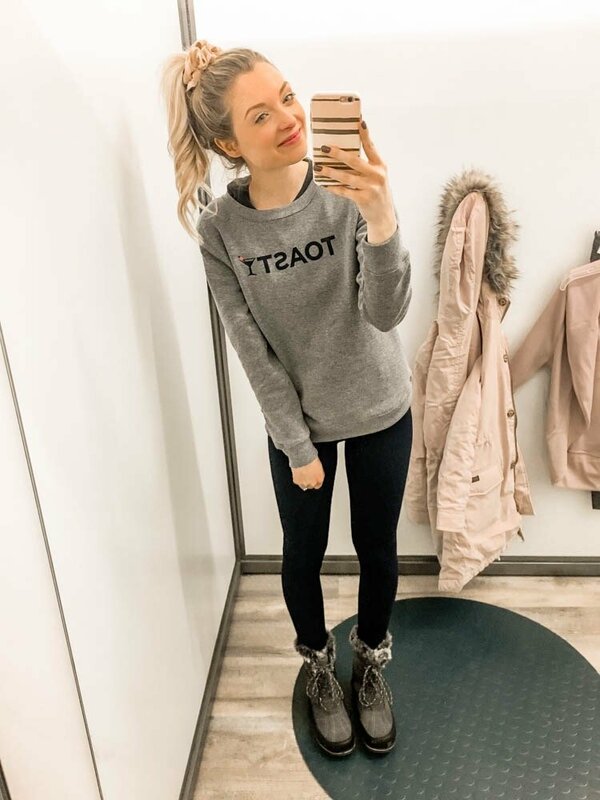 I tried on and purchased a few other things that would make great cozy gifts for her, and I will link them below! I’m also linking a bunch of other items that I just found on the Old Navy website! You can definitely stock up for yourself or grab a bunch of Christmas gifts for a great deal right now! You can also shop my whole outfit shown above by clicking on the items below the picture! I wear a size Small in the leggings, and the Winter boots are true to size (I got a size 8) with wiggle room for thick socks! These are all of my recent, cozy picks! If you want to shop all of my Christmas gift ideas for her from Old Navy, you can always go to my “Old Navy Christmas Shopping” tab here! This entry was posted in Fashion and tagged affordable outfits, affordable style, affordable style blogger, cardigans, Christmas gift ideas, Christmas gifts, Christmas gifts for her, cozy, cozy clothes, cozy gifts, cozy gifts for her, cozy outfits, cozy style, Fall outfits, Fall style, gift ideas, joggers, Old Navy style, style blogger, sweatshirts, try-on session, Winter outfits, Winter style.